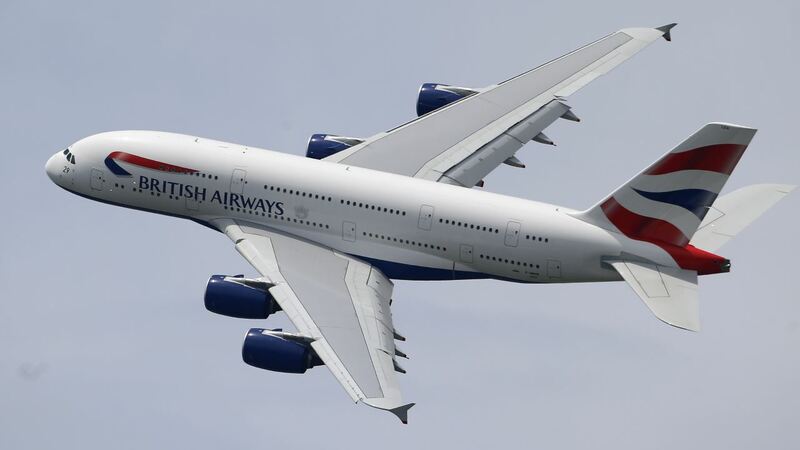 LONDON -- British Airways canceled all flights from London's Heathrow and Gatwick airports on Saturday as a global IT failure upended the travel plans of tens of thousands of people on a busy U.K. holiday weekend. The airline said it was suffering a "major IT systems failure" around the world. Chief executive Alex Cruz said "we believe the root cause was a power-supply issue and we have no evidence of any cyberattack." He said the crash had affected "all of our check-in and operational systems." BA operates hundreds of flights from the two London airports on a typical day - and both are major hubs for worldwide travel. Several hours after problems began cropping up Saturday morning, BA suspended flights up to 6 p.m. because the two airports had become severely congested. The airline later scrapped flights from Heathrow and Gatwick for the rest of the day. Passengers at Heathrow reported long lines at check-in counters and the failure of both the airline's website and its mobile app. BA said the crash also affected its call centers. Passenger Phillip Norton tweeted video of an announcement from a pilot to passengers at Rome's Fiumicino airport, saying the problem affects the system that regulates what passengers and baggage go on which aircraft. The pilot said passengers on planes that have landed at Heathrow were unable to get off because there was nowhere to park. "We've tried all of the self-check-in machines. None were working, apart from one," said Terry Page, booked on a flight to Texas. "There was a huge queue for it and it later transpired that it didn't actually work, but you didn't discover that until you got to the front." Another traveler, PR executive Melissa Davis, said her BA plane was held for more than 90 minutes on the tarmac at Heathrow on a flight arriving from Belfast. She said passengers had been told they could not transfer to other flights because "they can't bring up our details." Air industry consultant John Strickland said Saturday's problems would have "a massive knock-on effect" for several days. "Manpower, dealing with the backlog of aircraft out of position, parking spaces for the aircraft -it's a challenge and a choreographic nightmare," he said. Airlines depend on huge, overlapping and complex IT systems to do just about everything, from operating flights to handling ticketing, boarding, websites and mobile-phone apps. Some critics say complex airline technology systems have not always kept up with the times. And after years of rapid consolidation in the business, these computer systems may be a hodgepodge of parts of varying ages and from different merger partners, all layered on top of each other. A union official, meanwhile, blamed BA cost cutting for the travel chaos, saying the airline had laid off hundreds of IT staff last year and outsourced the work to India. "This could have all been avoided," said Mick Rix, national officer for aviation at the GMB union. While not that frequent, when airline outages do happen, the effects are widespread, high-profile and can hit travelers across the globe. BA passengers were hit with severe delays in July and September 2016 because of problems with the airline's online check-in systems. In August 2016, Delta planes around the world were grounded when an electrical component failed and led to a shutdown of the transformer that provides power to the airline's data center. While the system moved to backup power, not all of the servers were connected to that source, which caused the cascading problem. Delta said it lost $100 million in revenue as a result of the outage. In January it suffered another glitch that grounded flights in the U.S. That same month, United also grounded flights because of a computer problem. In July, meanwhile, Southwest Airlines canceled more than 2,000 flights after an outage that it blamed on a failed network router.